Last week, Mattel announced a brand new campaign that seeks to honor today’s most influential and successful women. The 70-year-old company which manufactures the legendary Barbie toy dolls, identified six “Sheroes” to receive their own “one-of-a-kind doll.” Oscar-nominated director and screenwriter Ava Duvernay was among the honorees. 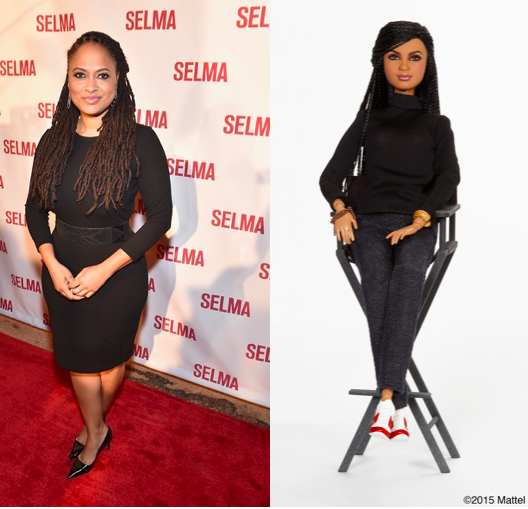 DuVernay’s Barbie sits poised in a mini director’s chair with long black braids and super stylish bangle bracelets. She has the distinction of being the only African-American and film director to be honored in the collection. “Barbie has always represented that girls have choices, and this Spring we are proud to honor six Sheroes, who through their trade and philanthropic efforts are an inspiration to girls,” said Evelyn Mazzocco, the Senior Vice President Global Brands Creative for Barbie Media. “Started by a female entrepreneur and mother, this brand has a responsibility to continue to honor and encourage powerful female role models who are leaving a legacy for the next generation of glass ceiling breakers.” The six women were acknowledged at the Variety Power of Women Luncheon (on Friday, April 24) in New York City and presented with their one-of-a-kind doll, which was auctioned off and the proceeds donated to a charity of their choice. Unfortunately, the “Shero” Barbies are not for sale, and there’s only one copy of each. National #Shero day was celebrated on April 27. DuVernay tweeted a photo of the figurine with this statement attached: “I always played w/ my sisters Jina + Tera. For hours making stories + scenarios. So this is special. Thanks @Barbie.” “Selma” will be released on DVD/Blu-Ray on May 5, and Paramount Pictures will mark the occasion by donating copies of the Oscar-nominated civil rights drama (along with study guides) to every high school in America.